This interesting surname, of Anglo-Saxon origin, is a topographical name for a "dweller by a plot of arable land". The derivation is from the Olde English pre 7th Century "aecer" meaning plot of arable land, with the later fusion of the Norman preposition "de". Topographical surnames were among the earliest created, since both natural and man-made features in the landscape provided easily recognisable distinguishing names in the small communities of the Middle Ages. 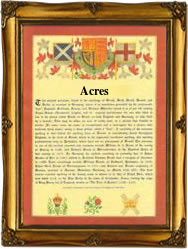 The surname may also be locational from Acre, in Norfolk, recorded as "Acre" in the Domesday Book of 1086. The surname is first recorded in the early 13th Century (see below). One, Adam de Acres appears in the Calendar of Letter Books of the City of London (1346). On January 29th 1541, Elizabeth Dakers married George Abraham at St. Stephen's Church, Coleman Street, London. William, son of William Dakers, was christened on February 25th 1571 at St. Margaret's, Westminster, London. The surname is also widespread in Scotland. Margaret Dakers was recorded in Barrellwall, Scotland in 1637 and William Dakers was a famous writer in Edinburgh in the 17th Century. The first recorded spelling of the family name is shown to be that of William de Acr' which was dated 1214, in the "Curia Regis Rolls of Sussex", during the reign of King John, known as "Lackland", 1199-1216. Surnames became necessary when governments introduced personal taxation. In England this was known as Poll Tax. Throughout the centuries, surnames in every country have continued to "develop" often leading to astonishing variants of the original spelling.